Modest levels of nitrate nitrogen – in the 75 to 100 mg/L range – may be more harmful to aquaculture-raised rainbow trout than producers realize. 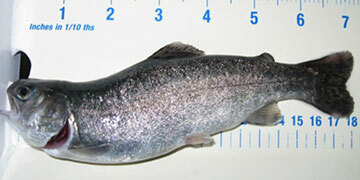 A team of scientists at the Conservation Fund’s Freshwater Institute led by John Davidson documented deformities and significant behavioral changes in rainbow trout (Oncorhynchus mykiss) raised in recirculating aquaculture systems (RAS) with nitrate nitrogen concentrations at levels less than one-tenth the recommended maximum nitrate nitrogen level of 1,000 mg/L. They believe the changes were spurred by chronic exposure to nitrate nitrogen. “If you see a problem in your system, don’t disregard nitrate nitrogen as a possible cause,” warns Davidson. In fact, Davidson and his colleagues almost did exactly that. They had designed a study comparing recirculating systems with various rates of water exchange. Where hydraulic retention time was longer and the feed loading rate was high, nitrate nitrogen and other water quality parameters grew more concentrated and the researchers observed fish swimming faster. Many of the fish swam on their sides, an unusual behavior possibly linked to abnormalities in their swim bladders or skeletal deformities. Fish in near-zero exchange recirculation systems also tended to “gasp” or “yawn” at the surface of the water, and had higher rates of skeletal deformities and mortality than fish in more frequently-refreshed tanks. Davidson and his team published their findings in Aquacultural Engineering. Davidson notes that the conventional limit for nitrate nitrogen in aquaculture tank water for rainbow trout is based on an LC50 value, a concentration that kills half the population. But sublethal concentrations may be quietly stealing profits and creating unhealthy conditions. “If fish are stressed based on a water quality parameter that’s present, that could impact performance in other ways, like feed conversion or growth rate,” he says. In tanks with low water exchange rates, high feed loading rates and high nitrate nitrogen concentrations, trout swam as much as twice as fast as their counterparts in high-exchange recirculating systems – as fast as 49 cm/sec, well above the speed of the tank’s current. Davidson suspects that sustained fast swimming can lead to higher oxygen demand, lactic acid buildup in muscle tissue, exhaustion, and even deformities that contribute to side-swimming behavior. “As soon as you start seeing behavioral changes, you’ve got to start thinking about fish welfare,” he adds. The aquaculture industry is working hard to stay ahead of activist groups who are beginning to set their sights on fish production after attacks on poultry, hog, dairy and beef production, Davidson notes - understanding the appropriate levels of nitrate nitrogen and other parameters will be a vital step in maintaining fish welfare standards that can withstand outside scrutiny. Nitrate nitrogen levels can build up in RAS systems rapidly as fish excrete ammonia nitrogen and biofiltration systems convert the ammonia nitrogen to nitrate and then to nitrate nitrogen. Davidson and his team monitored nitrate nitrogen levels carefully using two standard lab testing protocols, as well as with the YSI Professional Plus handheld, multiparameter meter. He says instant readings from the handheld meter will be important for staying on top of nitrate nitrogen levels in commercial settings. In addition to its nitrate nitrogen measuring capabilities, the Pro Plus can be equipped with probes for a wide variety of other key water quality parameters, including dissolved oxygen (DO), conductivity, specific conductance, salinity, resistivity, total dissolved solids (TDS), oxidation reduction potential (ORP), ammonium, chloride and temperature. With YSI’s Quatro cable, four probes can be used at once for DO, temperature, conductivity/salinity, and any two ISE’s - pH, ORP, ammonium, nitrate or chloride. Davidson found that the Pro Plus nitrate nitrogen readings were quite close to lab test values – no more than a 10 percent difference. “Based on what we saw, it was within the appropriate range to make an educated decision on whether to reduce nitrate nitrogen levels in an aquaculture tank,” he says. Limiting nitrate nitrogen buildup in RAS systems can be a challenge, Davidson acknowledges. Increasing the rate of water exchange could dilute nitrate nitrogen levels if water is available, he points out; if water supplies are tight, adding a denitrification unit or reducing feed load may help. More research needs to be done to establish guidelines to limit problems from chronic exposure to nitrate nitrogen in various species of fish, says Davidson. His team is publishing a report of a second study in which they replicated many of the behavioral changes observed during the first experiment in rainbow trout. A German team recently published a study of nitrate nitrogen’s impact on turbot, and a Virginia Polytechnic State University team led by Terry Hrubec documented changes in blood cell maturity, blood serum chemistry and antibody production in striped bass they say may link to nitrate nitrogen levels of 200 mg/L in tank water. Engineers can easily adopt design limits of 75 to 100 mg/L nitrate nitrogen to calculate biomass production and maximum feed loading rates, says Davidson. Until the practice becomes widespread, Davidson recommends keeping nitrate in mind if mysterious problems arise. Special thanks to John Davidson with The Conservation Fund’s Freshwater Institute, Shepherdstown, WV. Your comment will appear after it is reviewed.